More lovely weather over the last couple of days made walking round the island a real pleasure with a ringtail Hen Harrier hunting around Hooking the highlight on the 29th along with lingering waders including 49 Sanderling, 17 Dunlin and a Grey Plover. The 30th was a gorgeous, flat calm, warm day where birds included two Stonechats, three Rooks - including two which flew over very high to the south. There were counts of 16 Red-throated and 8 Great-northern Divers and a small influx of 17 Rock Pipits. Good numbers of Black-headed and Common Gulls are also now back on their territories and loudly shouting about it! 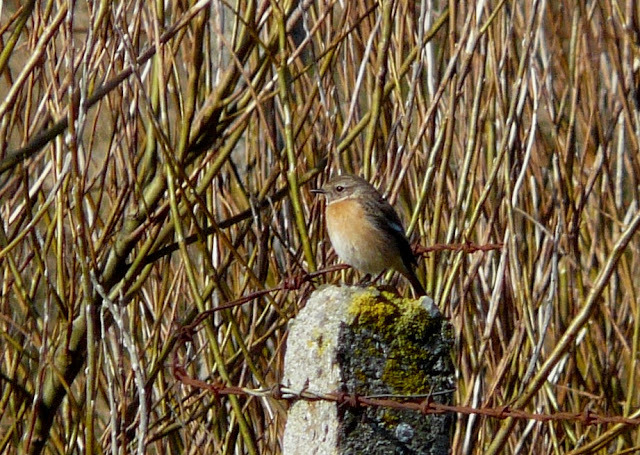 A couple of Stonechats were seen today; this is the bird which has lingered at Ancum for nearly a week, while a new individual (also a female) was near Garso in the afternoon. A real spring-like couple of days (albeit still a bit chilly!) with plenty of sunshine and light winds making it very enjoyable to be out in the field with many of the breeding waders such as Oystercatchers, Lapwings, Ringed Plover and Redshank starting to display and good numbers of Black Guillemots coming ashore and whistling at each other. New migrants were unfortunately thin on the ground with new birds on 27th limited to a moulting adult Slavonian Grebe in Linklet Bay and a single Knot with a group of Oystercatchers on the west coast. 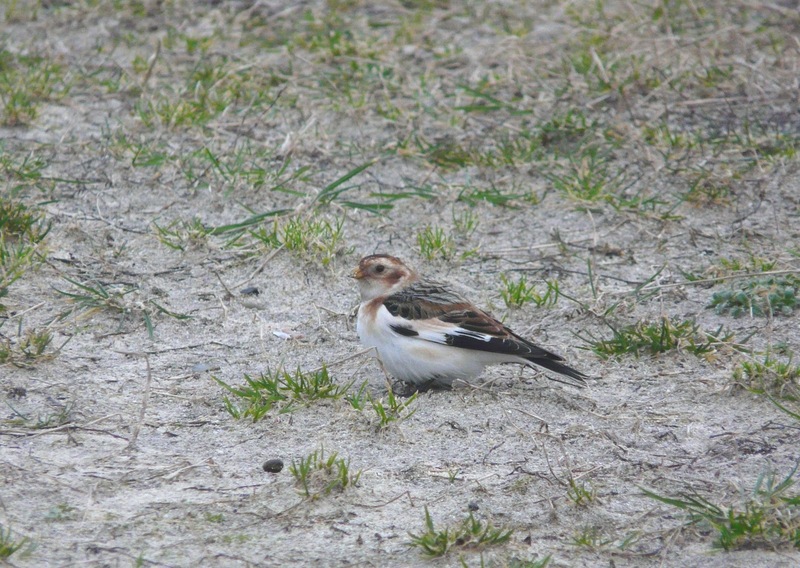 The 28th saw some signs of early spring movement with Skylarks seen heading north out at sea and several parties of Greylag Geese seen heading off north with singles figures of species such as Meadow Pipit and Pied Wagtail seen and the Golden Plover flock near Holland House increasing to 46 birds. The calm conditions have persisted over the last couple of days although few species seem to have taken advantage of the pleasant weather with little movement noted; a Stonechat was new on 25th along with a slight increase to 17 Redwings. A near summer plumaged Black-throated Diver which flew east past the seawatch hide was the highlight of the following day along with 13 Great-northern Divers, 9 Red-throated Divers and a good count of 364 Shags on the nearly flat calm seas. 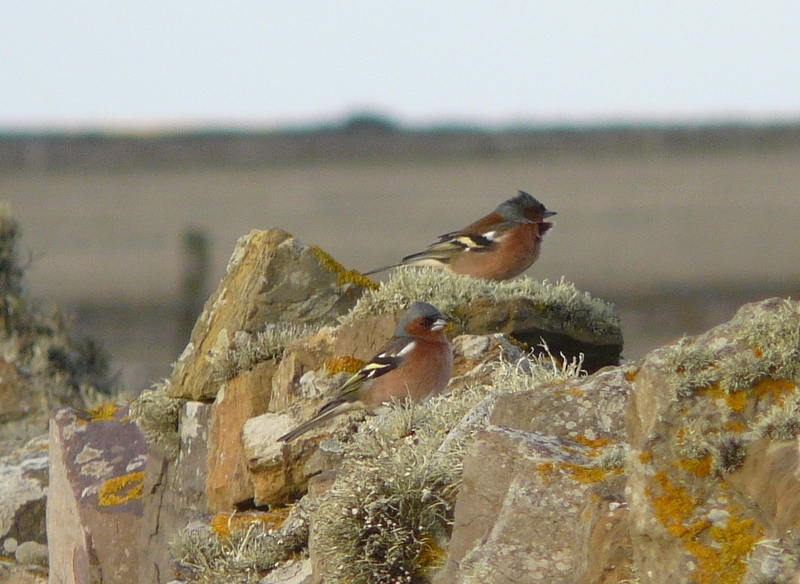 Other migrants were represented by an influx of 62 Black-headed Gulls (including several flocks seen coming in high from the south), two Rooks and a slight increase to 36 Fieldfares while small numbers of species such as Woodcock and Snow Bunting are still being seen. The stalemate continues with no real change in the weather or the birds. Thrush numbers remain similar and the 4 Woodpigeons were still in the vicinity of Holland House. A couple of Jack Snipe were flushed on 24th when calmer seas allowed 8 Great Northern Divers and 4 Red-throated Divers to be counted on the western coasts. The freezing gale force easterly wind and frequent snow showers have made the last couple of days census somewhat unpleasant (although compared to the rest of the country we've got off lightly!) There are still plenty of Blackbirds around with 74 counted on the latter date but new arrivals have been limited, the most notable being a Collared Dove on 21st and Dunnock on 22nd. There's been a small influx of Lapwings to 126 with migrants joining those which have already settled down to breed. Up to 3 Woodcocks have been seen along with 2 different Peregrines and 4 Woodpigeons. The mornings census was hampered by frequent snow blizzards, but just like yesterday a few new arrivals were logged. A female Stonechat near Howar and a Meadow Pipit at Bridesness were both firsts for the year. The White Wagtail was still at Bewan and at nearby Scottigar, presumably the same wintering Velvet Scoter reappeared, feeding offshore there with 10 Goldeneyes and a party of Long-tailed Ducks (42 were counted around the Island today). A Jack Snipe, 2 Lesser black-backed Gulls, 3 Woodpigeons, 4 Chaffinches and 3 Snow Buntings were the other migrants of note today. In much calmer, sunny conditions there was still plenty to see and a few new birds were unearthed during the days census. A Rook was the only addition to the year-list and there were now at least 2 Woodpigeons, plus the lingering Stock Dove. Fieldfares increased to 38 and Redwings to 18, while the other Thrush species were present in almost identical numbers to yesterday. There were now 5 Chaffinches and one of the most interesting events of the day was the capture of a Reed Bunting at Holland House, already wearing a Dutch ring-our first control of a foreign ringed bird of the species. A flock of 8 Grey Herons toured the Island, 2 new Hen Harriers were seen and 6 Great Northern Divers were counted around the coast. With the easterlies getting even stronger the extra coverage was welcomed and plenty of birds found today, mainly along on the sheltered west side of the Island. The highlight was the first Long-eared Owl of the year at West Beach, while other species recorded for the first time in 2013 were singles of Woodpigeon, Dunnock and White Wagtail-the latter the earliest North Ronaldsay record by 5 days! 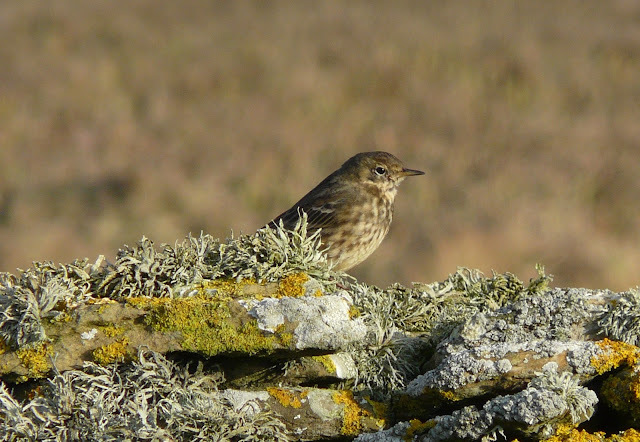 Thrushes continued to dominate with 129 Blackbirds, 8 Fieldfares, 7 Song Thrushes, 9 Redwings and 8 Mistle Thrushes counted. A Robin, Chaffinch and Snow Bunting were also seen and 8 Woodcock were flushed from various resting places. A Bean Goose was also new, the European White-fronted Goose seen again and Gadwall numbers up to 9. A decent gathering of large Gulls feeding in the swell near the Beacon included a juvenile Glaucous Gull, with 193 Herring Gulls and 148 Great-blacked Gulls also there. Finally the Stock Dove remains at the south end. Its been nice to see an early spring arrival of Blackbirds on the Island, with the majority of them being adult males-just like this one. The Stock Dove was still present on 15th when 2 Hen Harriers were seen from the Observatory windows. On 16th (just as the Rugby was about to start!) 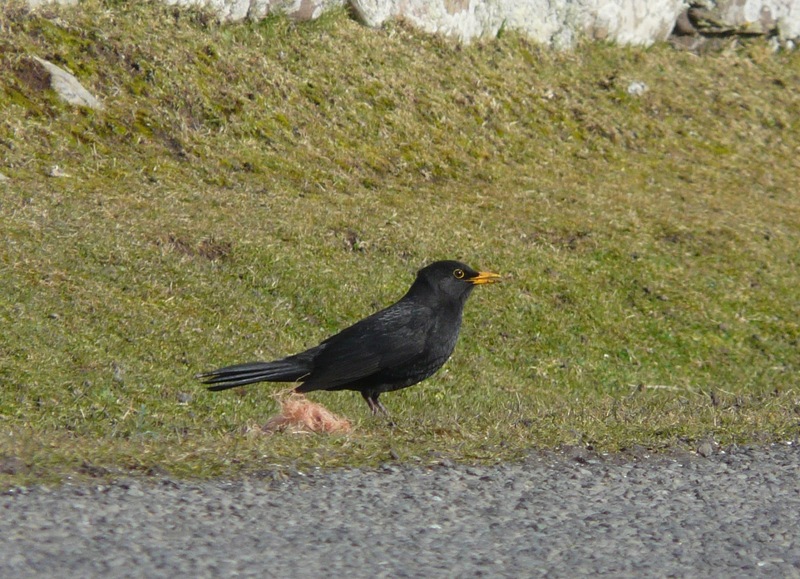 spring suddenly sprang into life mid afternoon when more than usual Blackbirds seemed to be in the Observatory car-park. A quick scramble around the traps and a check of Holland House gardens revealed 32 to have arrived, with virtually all of them appearing to be adult males. With the easterlies and regular rain we shouldn't have been that surprised and a proper look around the western coasts and crofts took place on 17th. A few other thrush species were also involved in this, the first 'fall' of the year and totals for the day were of 84 Blackbirds, 4 Fieldfares, 5 Song Thrushes, 14 Redwings and a new Mistle Thrush. There were also 10 Woodcocks and with ornithological backup due to arrive tomorrow in the form of Simon, our new Assistant Warden we'll hopefully have even more to report from now on. Not much to report with things remaining quiet and much the same as our last entry. 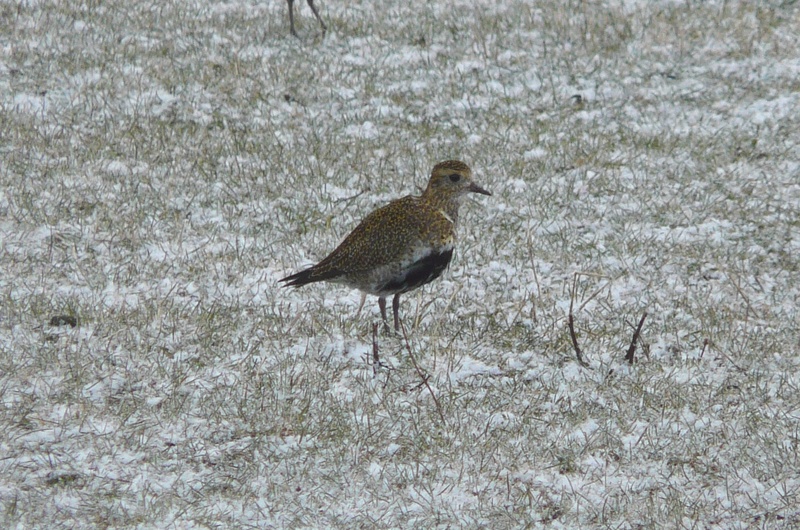 On 13th the Golden Plover flock had increased to 116 and Gadwalls gained 1 bird with 7 together at Bewan. There were 2 female Merlins seen and the first Hen Harrier for a while flew through the Island. 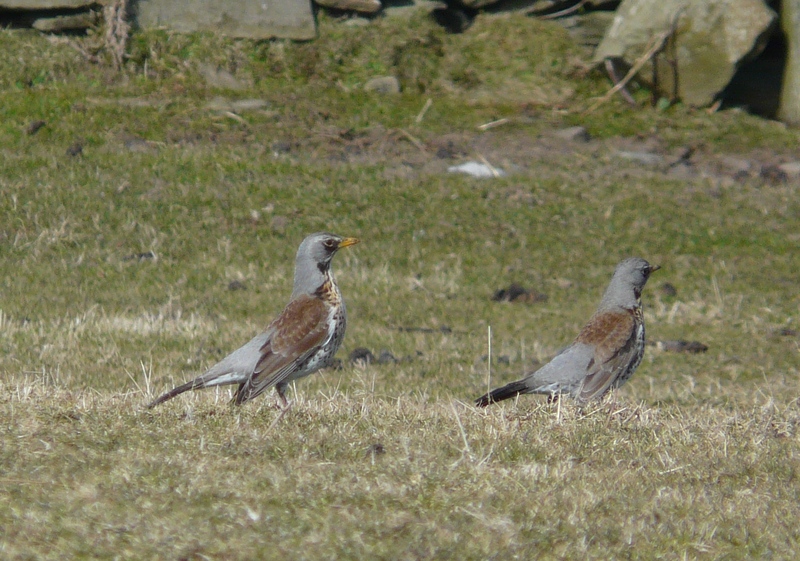 The Mistle Thrush reappeared with 24 Fieldfares at Holland House where the Robin remains and 68 Twite were still in the Kirbest crop field. The only sighting on 14th was of the Stock Dove still in East Loch Park. It remains cold, with daily unpleasant sleet or hail showers and winds from either the north or east. The Velvet Scoter was in Nouster Bay again on 9th, when the European White-fronted Goose was near the school. The monthly 'Webs' count took place on 10th and although wildfowl numbers have reduced of late 6 Gadwalls, 6 Shovelers 4 Pintails and 14 Tufted Ducks were noteworthy. The Stock Dove was seen again that day (and again on 12th) but a Mistle Thrush at Holland House was a true new arrival. 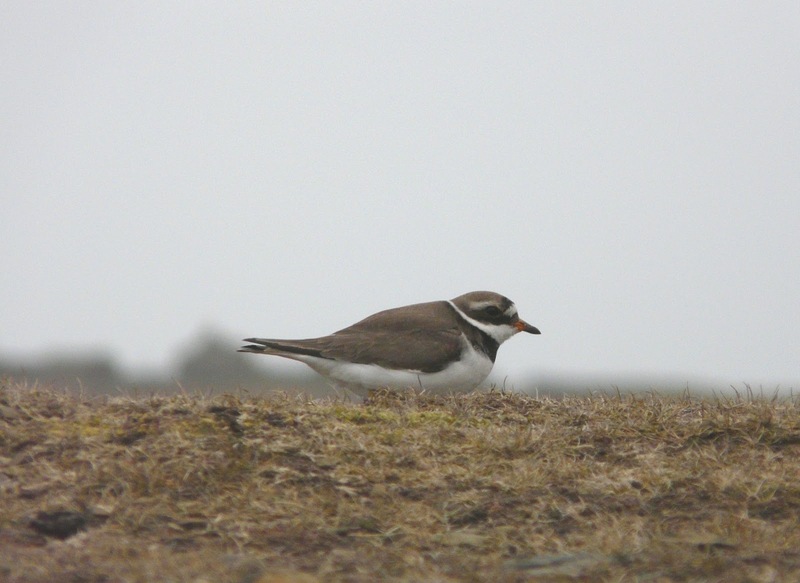 The first Tysties were seen ashore along the western coasts in calmer conditions on 11th, when Oystercatcher numbers reached 204 and 40 Golden Plover were the first in over 2 weeks. Its been a poor winter for 'white-winged' Gulls and on 12th a juvenile Glaucous Gull at Bridesness became only the second of the year. Just 2 Black-tailed Godwits were there this time and not before time the first Robin of the year was at Holland House. These 3 Whooper Swans have spent the winter on North Ronaldsay, joined today by a couple of Mute Swans. 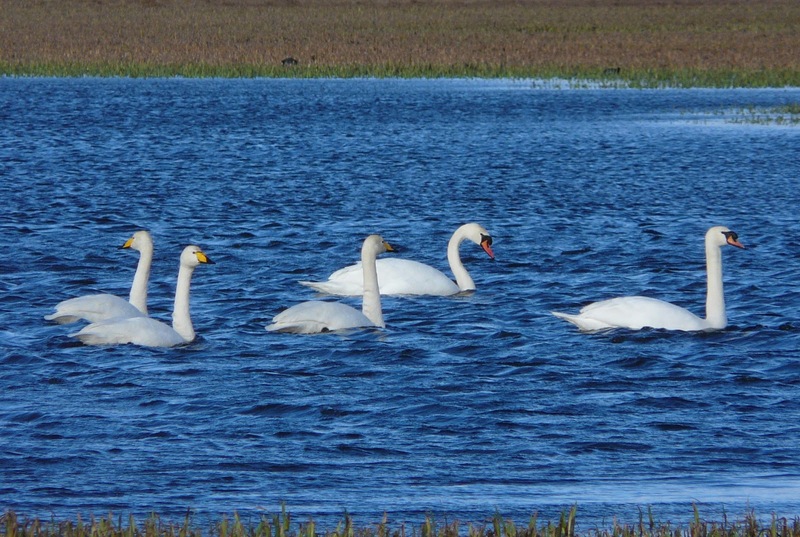 A blast of cold, easterly winds has come a few weeks early to bring any real signs of spring migration, with most of the notable sightings being of lingering birds. After not being seen for a couple of weeks, the wintering Black-tailed Godwit flock returned to Bridesness on 8th and had increased by 3 to now number 16 birds. 11 Goldeneyes were among the Gulls feeding in the swell offshore there, where up to 40 Black-headed Gulls have also now arrived. 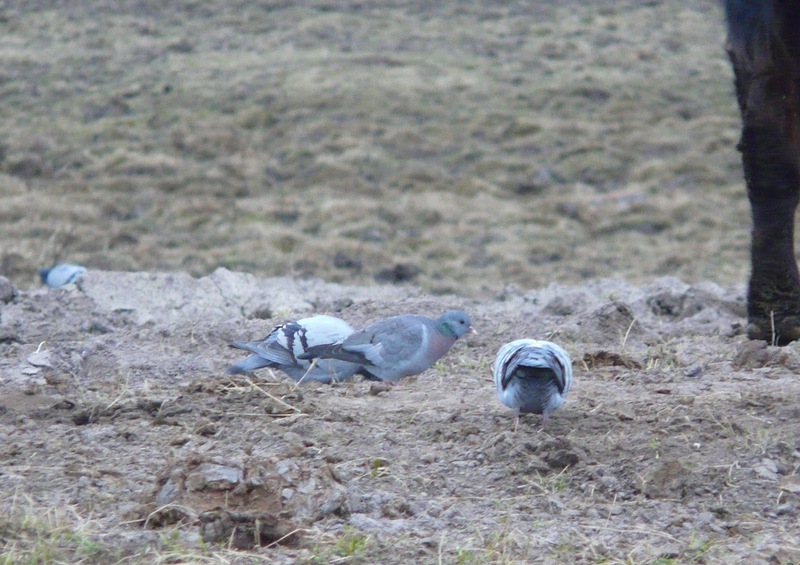 The Stock Dove continues to be seen daily, and at least 140 Skylarks were at Kirbest. With 'Walrus-mania' subsiding it was back to the day job, although things still remain relatively quiet on the bird front. Sylark numbers however, have more than doubled in recent days with 192 counted in the Kirbest crop on 5th. A Snow Bunting was with them the same day while the Stock Dove and a Peregrine were seen on both dates. 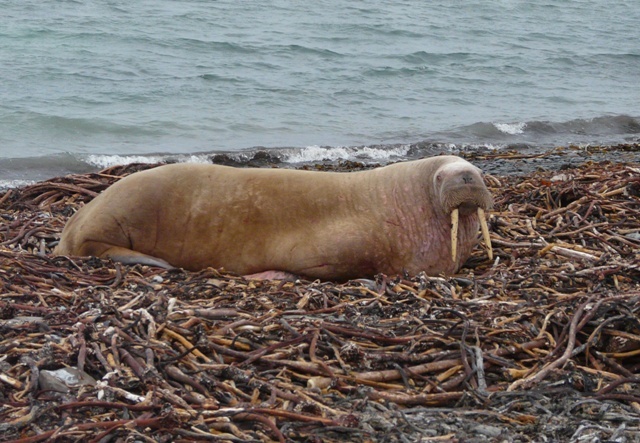 After all the media hype of the last 24 hours, the Island's first ever Walrus census took place today. 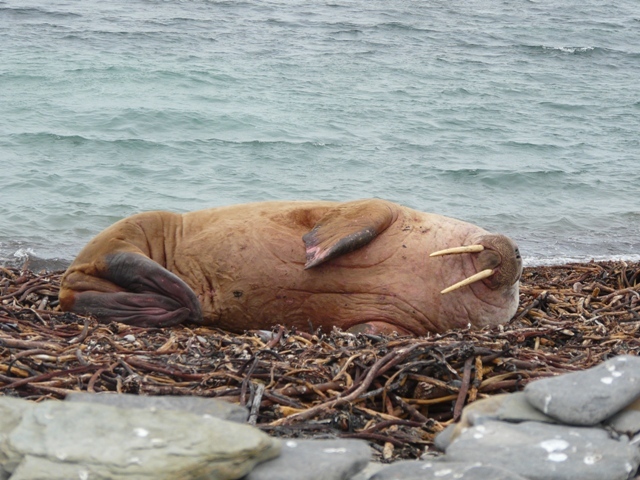 But after walking all 13 miles of the coastline there has been no sign of Waldo-our celebrity Walrus all day. 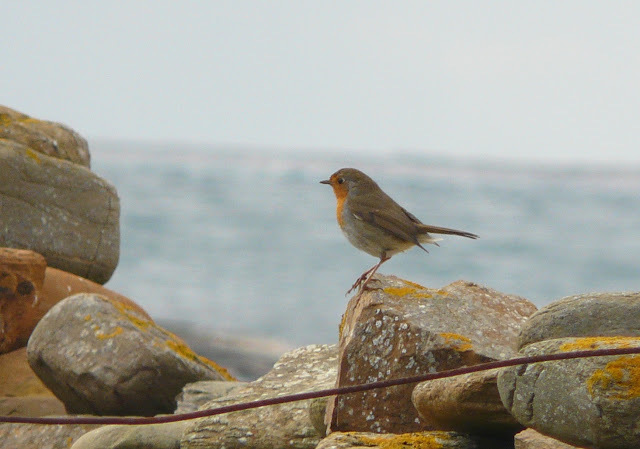 The beach at Bridesness was also visited several times but he may still be with us having been out feeding in North Ronaldsay waters somewhere. 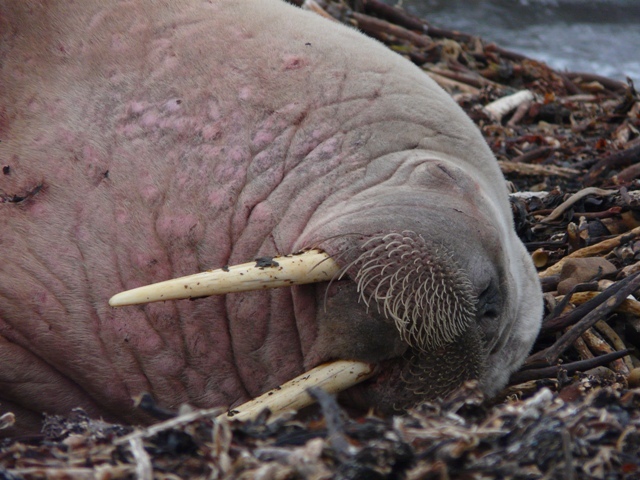 Walruses can apparently hold their breath for up to 30 minutes, so even such a large animal could easily go undetected for lengthy periods. On the bird front-a Pied Wagtail on the Links and a Lesser black-backed Gull on Garso Loch were the only newly arrived migrants. Some 130 Purple Sandpipers, 6 Red-throated Divers and 5 Great Northern Divers were the highlights from the coastal jaunt. 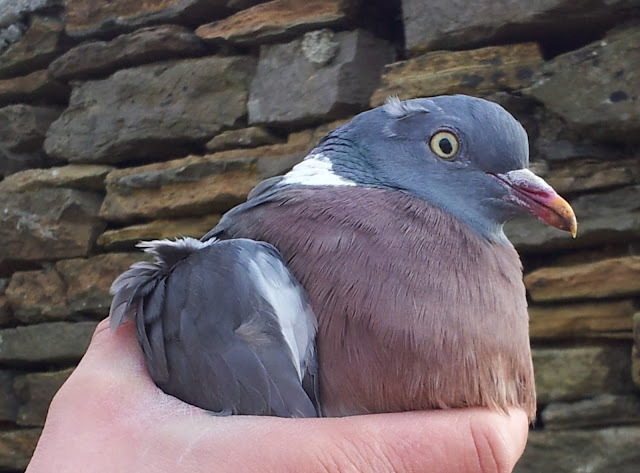 A Peregrine was also seen and the Stock Dove remains in the south of the Island. ...a bit bigger than your average Seal!!! ﻿In other less exciting bird news... The Stock Dove remains and 28 Fieldfares were near the mill. There were no new arrivals to speak of during the first few days of the new month, but old favourites from February included the Velvet Scoter in Nouster (on both dates) and the Stock Dove in East Loche Park (on 1st). The European White-fronted Goose was seen near Bridesness again on 1st and the 3 Pink-footed Geese were together in that area the next day. A couple of Merlins were near the Observatory on 1st when 2 Snow Buntings were also there and Skylark numbers have remained at around 50 birds each day.